Continuum blasts into its final season | TV, eh? If Friday’s first episode of Continuum is any indication, this final season is going to blow fans away. The Future Soldiers have Kiera Cameron (Rachel Nichols) in their sights and, intent on restoring order to the timeline, are willing to blow our heroine to smithereens. And they’ve got the tech to do it; Kiera’s suit just doesn’t seem to stand a chance. The first of these last six episodes, “Lost Hours,”—returning Friday at 9 p.m. ET/PT on Showcase—is packed with the stress, action and armaments of a feature film, which is exactly how Continuum‘s creator tackled the farewell storyline. “The six episodes really freed me up creatively because I didn’t have to service episodic storytelling,” Simon Barry says during a Vancouver set visit. “I said, ‘Let’s just do a six-hour movie and break it up into six chapters. '” Some fans vented their frustration on social media when Showcase announced the sci-fi project would conclude with Season 4, but Barry says he’d rather have a half-dozen hours to tie up loose ends than have three more seasons and be cancelled suddenly. The result? A storyline that sticks to the present timeline of 2015 Vancouver. To be honest, that’s quite enough. 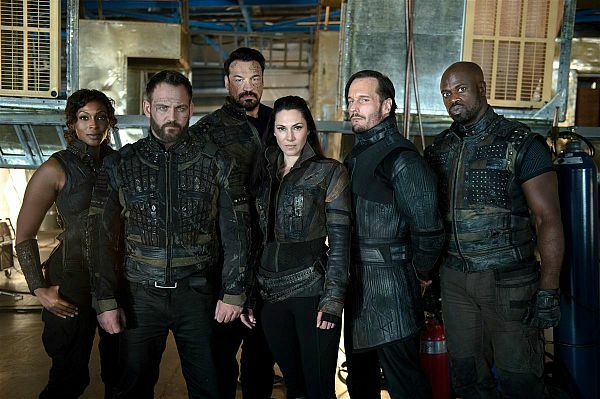 Along with the Future Soldiers (played by Lisa Berry, Ty Olsson, Aleks Paunovic, Kyra Zagorsky, Michael Eklund and Garfield Wilson), Kiera has to contend with Kellog (Stephen Lobo), who is on a course to become a powerful warlord in a war-torn future; a budding romance with Brad (Ryan Robbins); and a shaky alliance with Liber8 that puts her relationships with Carlos (Victor Webster) and Alec (Erik Knudsen) in jeopardy. Barry explains Kiera evolved in Season 3, realizing Liber8 was smaller fish and that she needed to think bigger if she wanted to have an effect on the future and did so by aligning with the terrorist group to take down Sonmanto. The partnership carries over to Season 4, but it doesn’t mean they’re sharing a beer anytime soon. As for the series finale episode, Barry is—as you’d expect—mum on the details, though he advises “There will be discussion,” among fans once the credits roll for the last time. Continuum airs Fridays at 9 p.m. ET/PT on Showcase. This is just the first in a series of Continuum stories TV, Eh? will be posting as the series comes to an end. Look for interviews with stars Rachel Nichols, Victor Webster, Erik Knudsen, Stephen Lobo and Roger Cross, and creator Simon Barry, in the coming weeks. Canadians can get a preview of the first episode on Showcase.ca before Friday’s broadcast. Why is Erik Knudsen so darn skinny? He looks like Alex O’loughlin did when he was on pain killer in Hawaii Five-0 before rehab. I have always loved Sci-fi movies and series, and Continuum is one of those TV shows or might as well be on the big screen that when you first see it your jaw drops! The sets in the future were so well done, the future cities, the traveling on air vehicles, every single detail has been given proper attention. I just picked up the series on Netflix, not sure why I never heard of it until now, on the shows’ Final Season year but I am glad I did. I think the show should have been more promoted, after all it’s rated 5 stars on Netflix.